On one occasion there was an all-star cast in "Faust" at the Metropolitan Opera, on a Monday night when all society appeared to sit in their boxes and show their anatomy covered with jewels: to gossip, to visit, to come in late and be observed of all observers, and to do everything but listen to the opera. There was Melba in her prime, and de Reszkes, and Bauermeister. The Swami had never been to the opera, and our subscription seats were in a conspicuous part of the orchestra. I had suggested that the Swami be invited to accompany us. Mama said to him, "But you are black. What will the world say?" To which he laughed and said. "I will sit beside my sister. She does not mind. I know." He never looked more handsome. Everyone about us was so wrapped up in him that I am sure they did not listen to the opera at all that night. 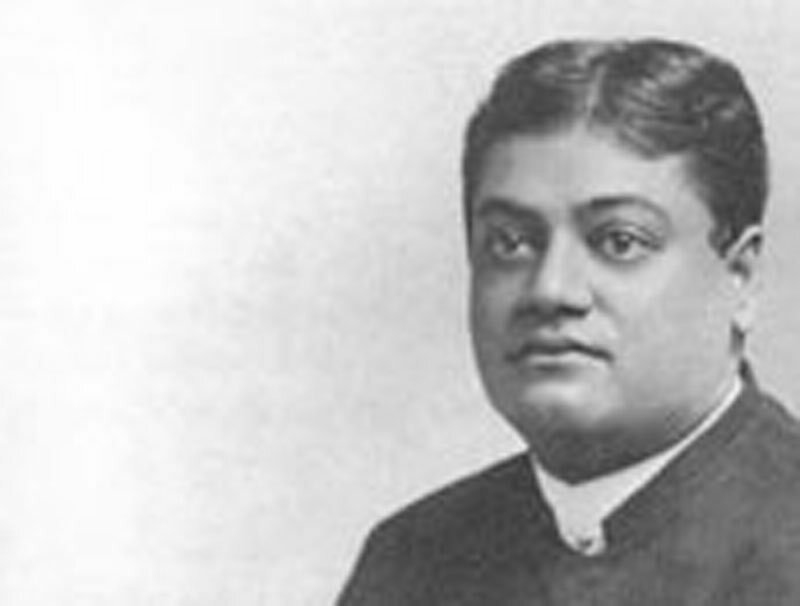 I tried to explain the story of "Faust" to Vivekananda. Mama, hearing me. said, "Heavens! you, a young girl, should not tell this awful story to a man,"
"Then why do you make her come herself, if it is not good?" said the Swami. "Well," replied Mama, "it is the thing to do to go to the opera. All the plots are bad; but one need not discuss the plot." Alas for poor, vapid humanity and its foolishness! Later on during the performance the Swami said, "My sister, the gentleman who is making love to the beautiful lady in song, is he really in love with her?" "But he has wronged her, and makes her sad." "Oh, now I see," said the Swami. "He is not in love with the handsome lady, he is in love with the handsome gentleman in red with the tail — what do you call him? — the Devil." Thus that pure mind reasoned out, weighed and found wanting both, the opera and the audience. One of society's pets, a very young girl, came down between the acts to Mama and said, "Mama is consumed with curiosity lo know who the elegant man is in the yellow dressing gown." Ours was a great friendship, and I fancy the only one that remains unpublished to the world. It was purely of the spirit, absolutely apart from the material loves and hates. He spoke always of when and what and where our souls would be ultimately, where in that other realm. He never spoke of me to anyone, nor mentioned my name. It was a friendship of Spirit. It still is. He taught me much of the philosophy he preached and wrote about, how to meditate, and what a power it would he against the hurts of life; what force of purpose it would attain for the preservation of the body, for logical thought, for self-control, for ecstasy, for the attraction of others; its power tor good, its knowing how to read others and their needs; not to dull the edge of your sword, to be moderate in one's consumption of food, to know what one's own body needs to make it live well; of chastity, tolerance, purity of thought, and love for the world — not of one person but of everyone and of all created things. How liberal he was, how understanding of others' points of view! He went to Mass with me at St. Leo's Church, the little one on Twenty-eighth Street, where all was beauty, and the old priest, Father Ducey, such an artist. There he knelt at high noon at the canon of the Mass. A ray of light falling from the stained-glass window — blue, red, and gold — lit his white turban and outlined his beautiful profile against the marble walls. A great, gorgeous spot of living fire his orange robe made on the marble pavement, and the dear face was rapt in prayer. As the bell rang at the consecration and all heads were bowed in adoration of the presence of Christ on the altar, his hand touched mine, and he whispered, "It is the same God and Lord we both worship."